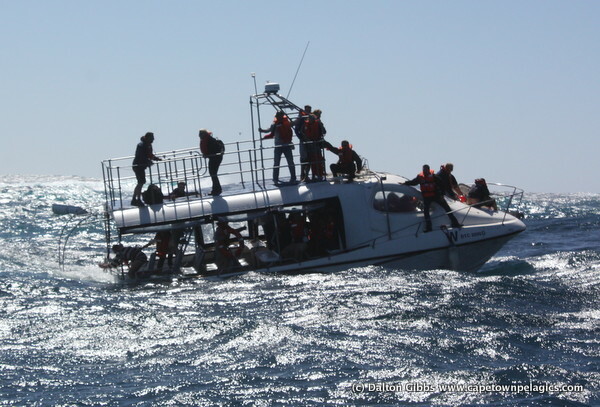 On 13 October 2012, a Cape Town Pelagics seabirding charter rushed to the scene of a capsizing boat and managed to rescue at least 25 people from the icy Atlantic waters near Hout Bay. Of these 25, twenty were pulled directly from the water by those on the Cape Town Pelagics boat, ably skippered by Sean Amor, and another five were brought to our vessel by a smaller rubber duck that could no longer hold them. Later boats rescued a further thirteen people and tragically, two people died in the sea. Below is a first hand account by Cape Town Pelagics leader Dalton Gibbs that will hopefully clarify some of the inaccurate news reporting of the Miroshga incident, and a thank you letter from one of the survivors. Cape Town Pelagics is very proud to be associated with all those aboard the boat who assisted as best they could in this tragic situation, including skipper Sean Amor and assistant Alan Tardin, leader Dalton Gibbs, and participants Debra and Phil Taylor, Tristan Cossey, Brian Benjamin, Lisa Mitford, Linda Heather-Noon and Fulton Somerville. We would welcome any feedback to info@capetownpelagics.com — Amanda Kropman, Deirdre Vrancken, Marje Hemp and Callan Cohen See http://www.capetownpelagics.com for more info. Saturday’s pelagic trip on the 14th Oct 2012 out of Hout Bay had gone well, with 14 pelagic species seen during the day. It was a five albatross day and apart from the commoner Shy, Black- browed, Indian and Atlantic Yellow-nosed Albatross, we also had two superb Wandering Albatross. The first bird was a younger bird, with white eye patches and the second an immaculate beautiful old snowy white bird. This bird sat on the water and allowed us great viewing opportunities and it was a pleasure to see. We headed back toward Hout Bay after lunch time, with a south easterly wind starting to pick up behind us. This wind was predicted to be strong by night time and we were giving ourselves plenty of time to make it back home. Some of the folk on board were feeling sea sick, but the ride back toward land was with the swell and it was fairly smooth sailing all the way. Just outside Hout Bay I asked Sean Amor, the skipper of our boat, the Extravagence, if we could make a small detour to Duiker Island to see the large Cape Fur Seal colony there. We entered the gap between the mainland and the seal colony and were just admiring the hundreds of seals when Sean remarked that he had seen a flare ahead of us. He was piloting the boat from the upstairs deck and so could see further than us on the lower deck. I trained my binoculars onto a boat some 300m ahead of us and saw the characteristic trail of smoke that a flare leaves. I shouted up to Sean and confirmed what he had seen and looked back at the boat. There was then a second and almost immediately a third flare that went up. Sean yelled that we were going to investigate and I told everyone who was watching seals to hold on. Being upstairs on the boat, Sean had a better view of things and as we got closer I heard him starting the emergency radio call “Mayday, Mayday, Mayday…”: the words anyone who goes to sea hates to hear. We covered the distance to the stricken vessel quickly and could immediately see that she was in trouble. She was the “Miroshga” and her stern was low in the water and without power she was slowly being pushed by the wind toward the rocky shore some 150m away. The passengers were clambering all over her and had their lifejackets on and a life boat pod was deployed in the water near by (see photo). Sean is an experienced skipper and after 25 years piloting boats in these waters knew the area well. Sizing up the situation he saw that she could capsize and stayed some 20m away from her; and we called upon the passengers to jump off and swim to us. We screamed “Jump! Jump into the water and swim to us!” as loud as we could. Between shouting I got onto my cell phone and called my wife to alert the NSRI at Hout Bay of the situation in case our Mayday distress call hadn’t been received by anyone. She naturally started the conversation with a cheery “Hello dear how has your …” but got rudely cut off as I yelled out what was happening, shouted instructions and hung up after I got a startled reply. She recounted afterwards that she was in a Woolworths check out queue at the time and was calling out what I was saying aloud. This naturally got strange looks from other shoppers around her, except for the sales assistant who proceeded to ask her as if nothing was happening “Can I swipe your card?”. She will probably make sales person of the month! Our instruction to jump into the water didn’t get much of a response as many of the passengers were naturally reluctant to jump into a cold angry sea. Never the less half a dozen or so jumped in the water and swam toward us. Alan, the boat deck hand and I threw ropes out to these people and pulled them alongside and hauled them into the boat. Phil Taylor, Tristan Cossey, Brian Benjamen and Fulton Somerville, all birding guests, did a great job and were alongside me helping the survivors on board. This all happened in a few a minutes and whilst we were engaged in bringing aboard the first group of people, the Miroshga capsized. I didn’t see this happen, but in the blink of an eye 30 or so people were strewn in the water and being scattered by the waves and swell. Sean the skipper quickly started to expertly maneuver our boat alongside survivors and we hauled them aboard in groups of twos and threes. I started moving survivors into our cabin to make space and balance our boat out. Debra Taylor, another member of our birding group, told me she had nursing training and was soon hard at work comforting survivors and assessing if there were any serious injuries. An inflatable boat arrived and also started picking up survivors, which they then transferred onto our boat. There were divers on this boat and being smaller and more maneuverable, they could get closer to the overturned hull. By this stage some 10 minutes had elapsed and the Nauticat, a larger public viewing boat, was also on site. Some of the survivors in the water were suffering the effects of cold exposure, and the last lady we picked up out of the water was struggling to grab the rope we had thrown to her. There were some survivors partially conscious on the deck and unresponsive, but the majority of the survivors were ok and in the cabin. Families had been split up and there were some emotional scenes as parents kept asking if we had their children or knew where they were. We couldn’t focus on this unfortunately with the immediate task of getting people out of the cold water as our priority to the sounds of sobbing and cries in the background. Out in the distance we saw the life boat deploy and like a large orange bag drift out into the Atlantic, driven by the strong south easterly wind. We later learnt that it wasn’t tied on and had a single crew member aboard. Fortunately he was picked up later by the NSRI. I shouted a head count of twenty five survivors on board up to Sean and we couldn’t see any further survivors in the water. We thus turned immediately for Hout Bay harbour to get the survivors ashore. As we raced around the coast with the mountain of Hangberg towering above us, I once again phoned my long suffering wife to ask her to alert the NSRI that we were on our way in with 25 survivors and what their condition was. I pretty much shouted this to her over the noise of the engines and then climbed over people until I was forward in the cabin and put this same message out over the radio. I noticed that the lady next to me had unfortunately vomited all over another lady’s head and I tried to clean this up, but only had a jacket to do this with. The vomit victim smiled weakly, she didn’t mind, this wasn’t the worse part of her day and it could wait she said. I got one of the survivors to hand out drinking water to those around her and then we arrived in Hout Bay, with many helping hands on the jetty to help people off our boat and to carry those who couldn’t. Phil Taylor and I carried a hypothermic lady up into the NSRI station where we took off some of her wet clothes and got her wrapped into a warm towel. All the emergency services were there as we sorted patients out, sending the bad hypothermic cases off to hospital and drawing up a passenger list. This was quite confusing and I helped to sort out names, check documentation and recounted survivors. Other survivors came in with the Nauticat and we adjusted the lists. At this stage the first casualty was brought into the station, which dampened our spirits. He had no identification on him, so we were unclear who he was at first. Over the next two hours it became clear, we had 33 people accounted for, one casualty and four missing. Time passed and with other rescue teams on site our hope that there might be more survivors started to dwindle; relatives of the missing people gathered at the station and their anguish was tangible as they waited for news. Then word came in that there were survivors knocking on the hull and miraculously over the next hour three ladies were recovered alive by rescue divers from air pockets in the hull. To me this was nothing short of a miracle given the conditions, the swells, the cold water and strong wind that I had witnessed. At the end of the day, of the 38 people on board the Miroshga, there were two casualties as one of the crew had unfortunately become entangled with the boats ropes and was still with her. Never the less, 36 people had been rescued as a result of the actions of the boats in the area and the emergency services that had responded; some 20 of these were picked up by us motley bunch of birders. I left the NSRI station later that evening having done all that we could at the time; Sean our skipper and the fellow birders who were on the trip with me that day had responded amazingly to an unusual crises situation and helped save lives; something entirely more wonderful than seeing that “snowy” Wandering Albatross that we had earlier in the day; this was something that beats anything on a birders life list. 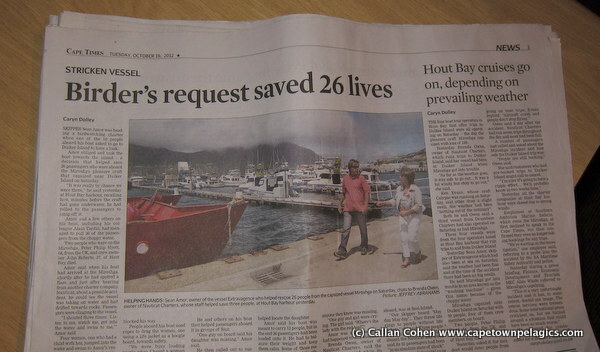 “I was one of the people you and your boat pulled out of the water in Hout Bay. I hope you don’t mind me tracking you down. finally I can thank you… please pass on my HUGE THANK YOUS to the others involved. I am back in the UK now and coming to terms with what happened (my mother in law was one of the women stuck under the hull of the boat) but thankfully we are all back together now. Thank you so much again for what you did for us. I know if your boat hadn’t of been there when it was, then a lot more people would not have been able to hold on. ← Cape Mountain Leopard on a Birding Africa day trip! Fortunately you were nearby. Well-done. Thanks! Hi there very cool blog!! Man .. Beautiful .. Superb .. I’ll bookmark your website and take the feeds additionally? I am satisfied to search out a lot of useful info here in the publish, we want develop more techniques on this regard, thanks for sharing. . . . . .